Businesses large and small, local and international, start-up and established companies all take advantage of the benefits an executive suite has to offer over traditional space. 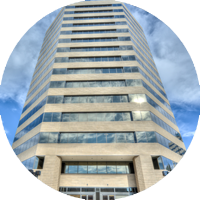 Large companies that are opening a Denver branch, attorneys, financial advisors, start-ups, sales reps, business owners and more find the flexibility and value of executive suites to be the perfect match for their business needs. What services are included in my lease? We offer an all-inclusive office experience where all you need to bring is your computer and you are ready to work. Our offices include furniture, high-speed internet delivered over fiber, telephone answering, a telephone handset, a professional DTC mailing address, manned reception desk, free parking, 24/7 access, and more! Our flexible lease terms are perfect for growing businesses. Our programs range from 6 months to 3 years. What if my needs change during my term? We understand business needs change and we are here to help your business grow! Upgrading from a virtual program to an office or adding space for your team is always an option at any time during your contract term. Simply fill out our contact form or call us at 303.228.2280 and we will be in touch to set up a tour and discuss your business needs. We can get you started in as little as 24 hours once your lease has been signed! What size offices do you have and how much do they cost? We have a wide variety of office sizes, each with a different price point at very competitive rates. Can I move in the middle of the month? Definitely! We will simply prorate that month’s rent. Absolutely! Our sophisticated phone system offers multiple options for providing you with a phone number or keeping your existing phone number. We will still answer the phone in your company name and transfer the calls to your desk phone or cell phone free of charge! Is there someone around to greet my guests when they arrive? Definitely. Our friendly reception staff is at the desk Monday thru Friday 8 AM – 5 PM to greet your guests, notify you of their arrival, and answer as many questions as possible. Yes! Both of our DTC facilities have FREE and ample parking for you and your guests. No more circling around looking for parking spaces. Free parking is a significant cost savings. What if I only need a part-time office? No problem! Our virtual office programs and office time programs are great alternate options for the company that isn’t quite ready for a full-time office but still needs that professional image. How do virtual services help my business? All of our virtual programs include the use of a professional DTC mailing address. This means that you can publish our address on all of your business materials and even change it online so that when someone searches for your business it shows you in one of our Class A buildings instead of a home address. Other services include professional phone answering and conference room time to really give your business the professional advantage. Fill out our contact form or call us at 303.228.2280 and we will determine the plan that best fits your business needs. Mail services can be set up the same day the agreement is signed, phone services can take up to 48 business hours to get programmed. How long is the agreement term? Our virtual agreement term is a 6-month term. Absolutely! Our sophisticated phone system offers multiple options for keeping your existing phone number. We will still answer the phone in your company name and transfer the calls to the number of your choice. When can I come and get my mail? Our office hours are Monday thru Friday 8 AM – 5 PM and you are welcome to come in and collect your mail any time during those hours. What if I don’t need mail and phone service, just a place to work? Our Office Time Programs will be perfect for you! Enjoy the professional setting and get work done in our well-appointed day offices without paying for additional services you don’t need. You can visit our meeting rooms page to reserve online or call us at 303.228.2280 to reserve over the phone. How far in advance do I have to reserve the room? Our rooms are available on a first-come, first-served basis so we recommend reserving the room as soon as possible! When can I have my meeting? Our business hours are Monday thru Friday 8 AM – 5 PM. With over 10 conference rooms in the Denver Tech Center, we can accommodate groups from 2 to 30. My team needs WiFi, is that included? Yes! High-speed WiFi is available at both of our facilities. I need to show a presentation – do you have equipment we can use? Absolutely. Conference rooms are equipped with flat-screen televisions that you can connect your laptop to so you can display your presentation for all of your guests. Can I bring in catering? Definitely! There are a number of local restaurants that will deliver to our locations and you are welcome to bring in any catering you desire. Are there beverages available for my guests? Yes! Each conference room has a variety of beverages available. Do your rooms have a view? Yes! Both of our boardrooms have stunning views of the Rocky Mountains that are sure to impress your guests!